Saratoga Springs, NY, June 21, 2012 – Espey Mfg. & Electronics Corp. (NYSE MKT: ESP) was recognized by the Defense Security Service (DSS) with the 2012 James S. Cogswell Outstanding Industrial Security Achievement Awards. Peggy Murphy, Director HR/Corporate Secretary/Facility Security Officer was presented with the award on June 13, 2012 at the National Classification Management Society Annual Seminar in Orlando, Fla. The Cogswell award is the most prestigious honor that can be bestowed to U.S. Defense cleared contractors. The Cogswell Award, established in 1966, is named in honor of the late Air Force Col. James S. Cogswell, the first chief of industrial security within the Department of Defense. Cogswell was responsible for developing the basic principles of the Industrial Security Program, which include an emphasis on the partnership between industry and government to protect classified information.The criteria focuses on principles of industrial security excellence, which include establishing and maintaining a security program that far exceeds the basic National Industrial Security Program requirements; and providing leadership to other cleared facilities in establishing best practices while maintaining the highest standards for security. Espey’s primary business is the development, design, and production of specialized military and industrial power supplies/electronic equipment. The Company’s web site can be found on the internet at www.espey.com. Mark St. Pierre, President and CEO, Espey Mfg. 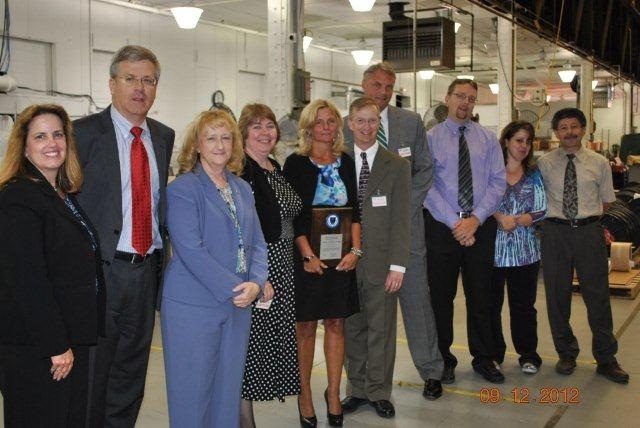 & Electronics Corp.
Peggy Murphy, Director Human Resources, Corporate Secretary, Facility Security Officer, Espey Mfg. & Electronics Corp.
Christopher Smith, IT Manager, Information System Security Officer, Espey Mfg. & Electronics Corp.
Christine Earls, Asst. Facility Security Officer, Administrative Asst., Espey Mfg. & Electronics Corp.
George Sloan, Asst. Facility Security Officer, Mngr. Environmental Test, Espey Mfg. & Electronics Corp.
For further information, contact Ms. Peggy Murphy or Mr. Mark St. Pierre at (518) 245-4400. Saratoga Springs- On Tuesday, September 18 at 7:00 pm in the Canfield Casino the Saratoga Springs History Museum presents Professor Thomas Chambers will explore Saratoga Springs as a 19th century spa and the creation of a new leisure class of Americans. Few public places in the early nineteenth century offered men and women from different regions of the U.S. the opportunity to socialize with each other. At the resorts of Virginia’s western mountains and Saratoga Springs, the nation’s social, economic, and political leaders gathered at the mineral springs to relax and recuperate, and in the process began to form a ‘fledgling aristocracy.’ At these resorts the boundaries of class and region were defined, tested, solidified and broken by the Civil War, but eventually repaired in its aftermath. No other movement or establishment challenged the springs as the social centers for the American leisure class. Professor Chambers describes how the springs attracted the cultural elite through architecture, bucolic landscapes, and claims of medical authority and high fashion. The conflicts between old and new money created tension, and status was open to negotiation at the springs. Chambers examines how these conflicts illustrate the nearly constant process of social display, class construction, and the negotiation of gender roles. Professor Thomas Chambers is Chairman of the History Department at Niagara University. He has a Ph.D. in American History from the College of William and Mary. Professor Chambers has also published Crosswords of Empire: Cultural Exchange and Imperial Rivalry at Old Fort Niagara. He is a member of the War of 1812 Bi-national Bicentennial Committee and the Underground Railroad Commemoration committee. Professor Chambers was the 2009 conference Co-organizer of Contests for Continents: The Seven Years War in Global Perspective. This event is part of the Alfred Z. Solomon Charitable trust program series. It is free and open to the public. For more information call the History Museum at 518-584-6920 or visit www.saratoghistory.,org. was shared by all. The couple departed for a honeymoon in the front of the barnyard. This is just one of many stories that continue to be retold by our summer campers dealing with life-threatening illnesses to their family and friends in the afterglow of camp. Camp may be over but the stories carry on. As do the fundraising efforts to meet a $3.2 million operating budget by end-of-year. It is never too late to sponsor a Double H camper for their morning ($125) or week ($1,800) of Summer Residential Camp. This year a gift of sponsoring a camper is extra special as the Double H Ranch celebrates its 20-year anniversary and works to meet a Challenge presented by the SeriousFun Children’s Network―to raise $90,000 from donors who sponsor a camper for the very first time, in return for a $30,000 grant. The Summer Residential Camp program hosts 900 campers (seventy percent from New York State) free-of-charge who, because of a medical diagnosis, are unable to attend other summer camps. Your sponsorship, 24-hour/on-site medical personnel, a 2:1 camper/counselor ratio and hundreds of volunteer partners bring Double H children their week of never-ending stories and Adirondack adventure. For more information on sponsoring a Double H camper, call Linda at 518-696-5921or go to http://www.doublehranch.org and click on the Blaze A Trail icon. The mission of the Double H Ranch is to provide specialized programs and year-round support for children and their families dealing with life-threatening illnesses. Our purpose is to enrich their lives and provide camp experiences that are memorable, exciting, fun, empowering, physically safe and medically sound. All programs are FREE of charge and capture the magic of the Adirondacks. SARATOGA SPRINGS, NY – Saratoga Hospital’s Greno Industries Run for the ROC will be held on Sunday, September 30 at the Saratoga Race Course. The event raises awareness and funds benefiting the patients of the Mollie Wilmot Radiation Oncology Center. Registration begins at 9am with the run/walk starting at 11am. The entry fee is $20 prior to September 21 and $25 after that date and on race day. Prizes and awards are given to the top three male and female runners, as well as the top male and female in each age group. Adirondack Trust Company will once again be sponsoring the Corporate Challenge. Other sponsors include Greno Industries, STAR 101.3, Saratoga.com, NYRA, The Saratogian, Longfellow’s Inn & Restaurant/ The Olde Bryan Inn, The Fort Miller Group, Suny Empire State College, Mazzone Group, Kweilyn Taylor, Strategic Solutions, Janitronics, and Fleet Feet. Saratoga Hospital is the Saratoga region’s leading healthcare provider. The only acute-care facility in Saratoga County, the hospital has a medical staff of over 450 physicians and other credentialed providers, offering care in a broad range of medical specialties. In keeping with its emphasis on quality, Saratoga Hospital was the first in the Capital Region to earn Magnet Designation for nursing excellence. The hospital achieved redesignation in 2010. Hospital facilities include: Saratoga Hospital, Saratoga Care Nursing Home, Wilton Medical Arts, Malta Medical Arts, Saratoga Surgery Center, Mollie Wilmot Radiation Oncology Center, Saratoga Family Physicians, The Saratoga Center for Endocrinology and Diabetes, Saratoga Hospital Pain Management Center, Saratoga Family Health, Schuylerville Family Health and Galway Family Health. For more information, go to http://www.saratogahospital.org. 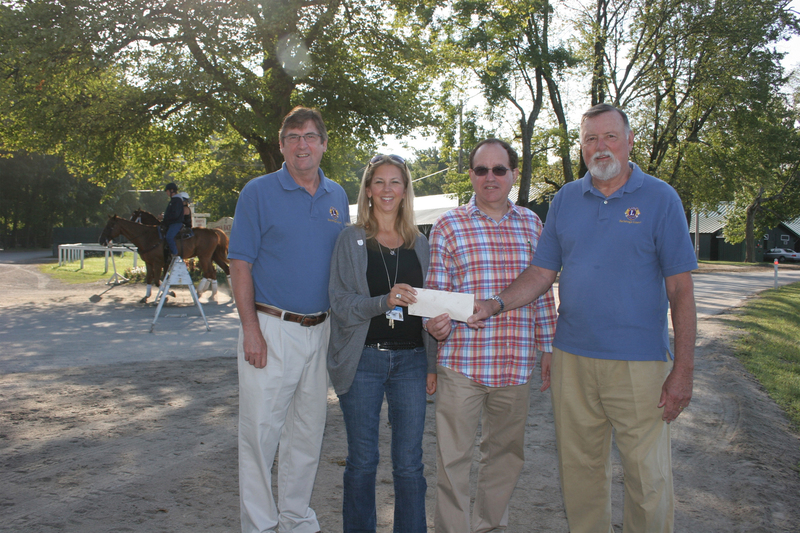 Photo, L to R / Credit: Saratoga Springs Lions Club: William Gibeault, President of the Saratoga Springs Lions Club, Paul Rauchene, Executive Director and Julie Roberts, Community Liaison Director of the Backstretch Employees Service Team (B.E.S.T. ), Richard Reeves, Saratoga Springs Lions Club Member. September 4, 2012 (Saratoga Springs, NY) – Members of the Saratoga Springs Lions Club recently presented the Backstretch Employees Service Team (B.E.S.T.) with a donation directed to help provide the backstretch workers at Saratoga Race Course with vision and diabetes screening. The Saratoga Springs Lion’s Club has worked closely with B.E.S.T. over the past few years providing entertainment for the backstretch workers by presenting “Casino Nights” where the backstretch workers play casino games for chips that can be turned in for prizes at the end of the evening. “We are very happy to be able to support the activities of B.E.S.T., which provided such an important role in the success this summer of the greatest thoroughbred racing in the nation at the Saratoga Race Course,” said William Gibeault, President of the Saratoga Springs Lions Club. The Saratoga Springs Lions Club works to promote awareness of, and provide support for, the areas of sight and hearing conservation, diabetes and youth programs. For more information, visit http://www.saratogalions.com. The Saratoga Springs Lions Club actively works to promote awareness of, and provide support for, the areas of sight and hearing conservation, diabetes and youth programs. For more information, visit http://www.saratogalions.com. September 6, 2012 – Albany, NY – The President of the United States of America has awarded the Purple Heart to New York National Guard Lieutenant Colonel and Tully Rinckey PLLC Founding Partner Mathew B. Tully. Established by General George Washington at Newburgh, N.Y. on Aug. 7, 1782, the Purple Heart is a U.S. military decoration awarded to those who have been wounded or killed while serving with the U.S. military. Tully, who earlier this year stepped down from his chief executive role at Tully Rinckey PLLC to carry out his military duties, received the Purple Heart for wounds he sustained in a suicide bombing while serving in Afghanistan. Mr. Tully is currently recovering from his injuries and is expected to return to his leadership role at the firm in spring 2013. Mr. Tully sustained his injuries on Aug. 7 when a suicide bomber, using a vehicle-borne improvised explosive device (VBIED), attempted to kill him and others from his unit. Fortunately, no U.S. service members were killed in this attack near the village of Pul-I-Alam in Logar Province, Afghanistan. Last May, he received the Combat Action Badge when hostile forces, armed with AK-47 rifles and rocket-propelled grenades, attacked him. He was not injured in that earlier attack. “Mat has made many sacrifices in his long service to our country, and I’m proud to run a business with him. We are hoping for his speedy recovery as I’m sure he’s eager to get back to fighting beside our troops in the field,” said Managing Partner Greg T. Rinckey, who is himself an Army veteran having served for six years with the Judge Advocate General’s (JAG) Corps. Although Mr. Tully works as an attorney at his full-service law firm in Albany, he does not serve as a JAG attorney in the Army. Instead, he serves as a combat arms officer. His military career dates back to 1991, when he joined Hofstra University’s ROTC program and met Mr. Rinckey. His firm, Tully Rinckey PLLC is a Service-Disabled, Veteran-Owned Small Business (SDVOB) and was founded following Tully’s escape from the World Trade Center on Sept. 11, 2001. The Purple Heart is the U.S. military’s oldest decoration still being awarded. Between Dec. 5, 2001 and June 30, 2012, 7,272 service members involved in the war in Afghanistan – Operation Enduring Freedom – have been awarded the Purple Heart, according to the U.S. Army Human Resources Command. 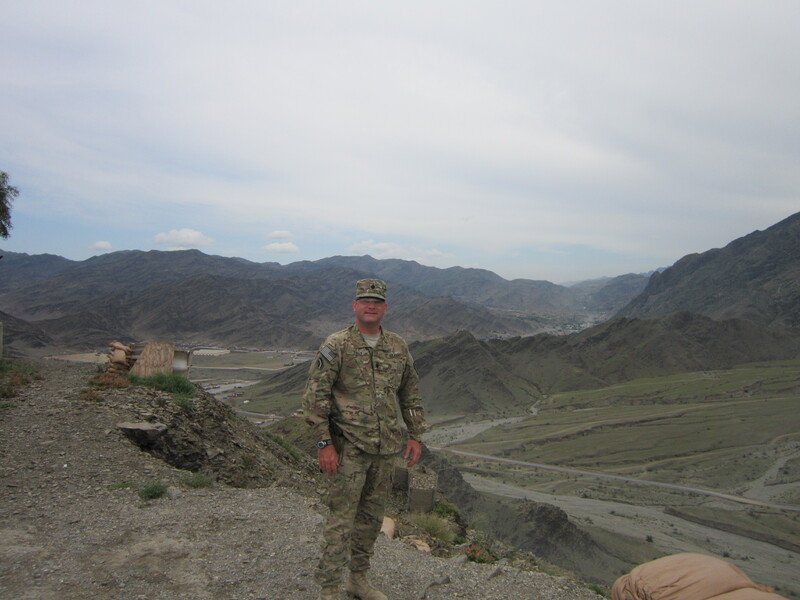 Since founding Tully Rinckey PLLC in 2003, Mr. Tully has temporarily left his growing company for deployments in Iraq, Egypt, and Afghanistan. He is currently on a military leave of absence from the law firm, as provided for by the Uniformed Services Employment and Reemployment Rights Act (USERRA). This federal law protects the civilian employment of military members and Mr. Tully has pioneered the litigation of military service members’ rights. Most notably, in 2007 Mr. Tully helped then-Sen. Barack Obama make improvements to the Act that ultimately were signed into law by President George W. Bush. One year ago, September 1, will mark one-year anniversary of the filming of the Saratoga Lip Dub. It’s now been viewed by nearly 65,000 people across the world and inspired us to become one of the leading chambers in the US in the use of video to promote our community.